“The window of Kusselmann’s shop was full of teeth. They were laid out in neat rows along polished ebony shelves, and piled into small mounds in blue and white porcelain bowls the size of your hand. In a German town many years ago a teeth puller is called to a lodging house. Two of its boarders have died and its time to get some money for their teeth. What the lady who owns the house does not know is that one of the men had no teeth, he has gold and one shiny, shiny diamond, set inside fake teeth. Its not Klaus’ fault he sees the master pul out the diamond and pocket it without a word to anyone. Its not his fault that as soon as Frau Drecht works out what was in those teeth her and her son will come seeking him out. He also has no clue that other people are on the look out for that diamond either, especially not the Jesuit priest and his Aztec companion, and why a professor of anatomy would take an interest is beyond anyones comprehension. No Klaus just wanted a peaceful life, but when he finds himself pocketing the diamond, it soon becomes apparent that he will not get that, no… for some reason a feathered man is now after him too and getting away has become a matter of life, or death. So this book has been sat on my tbr pile for over 18 months and its safe to say it should have been read a lot time ago, especially as it was a review book that was sent to me because I absolutely loved the sound of it, but it was one of those that I knew may not deliver to my expectations to I put it off! Thankfully now I’ve read it I can safely say that it met expectations and I can definitely say it is one heck of a creepy book – don’t read it at night whatever you do! So Germany is a dodgy place in the time that The Feathered Man is set and this book, with its elements of magical realism and ghost like characters, is definitely in keeping with the time setting. There are so many sinister elements to the book and you are never sure who to trust. The spooky-ghostlike elements of the book which attributed to me getting tweets declaring how scary it was when I started reading, are really just a minor aspect of the book and theres a lot more crime and social standing to the book than scary parts. This may however be my take on it because I am a 25 year old woman and not a 11 year old girl… had I read this book back hen I was that age I’m fairly sure I would have been terrified and probably wouldn’t have picked up on the social and religious commentary of the book, but I enjoyed all aspects as an older reader for sure. The story is creepy but quite simple and enjoyable. The characters are all interesting enough and some of them really intrigued me. I will say that there were so many characters introduced by name who possibly didn’t need naming – I got confused as to who was who with minor characters – but I liked what imagery that conjured up. I loved the way the book was written and for such a lengthy book I managed to read it really quick, it flowed well and had just enough complexity for me to not be bored but not too much so that I could easily read it at my fastest pace and pick up on everything going on. I loved some od narration and how it really showed the terror of what was going on, especially later in the book where there is a blurring of setting as such. I am kicking myself for not reading this sooner and to be honest even though it didn’t blow me away I still really enjoyed it. I think a lot of higher level middle graders will love to read this book, however I do stick to my first warning about it; no bedtime reading if you don’t want nightmares! 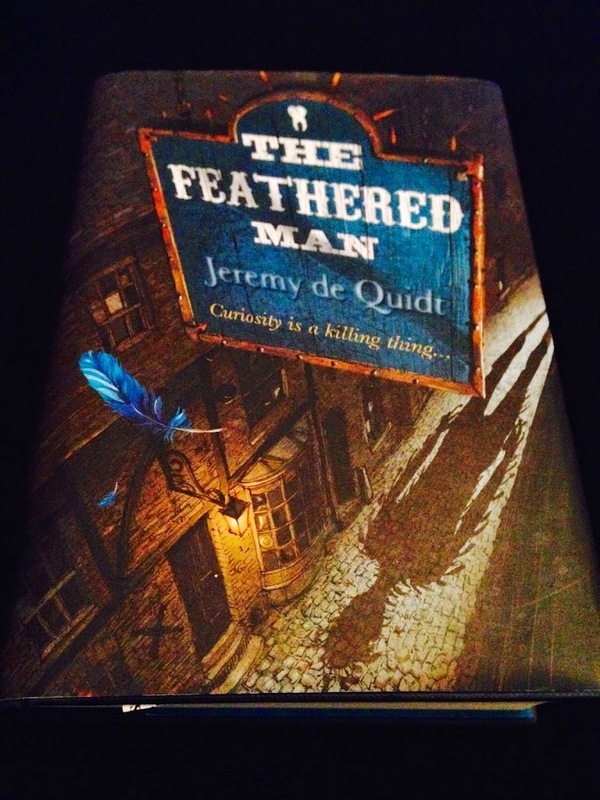 The Feathered Man was published in November 2012 by David Fickling Books. My copy was sent to me from the publisher in exchange for an honest review.